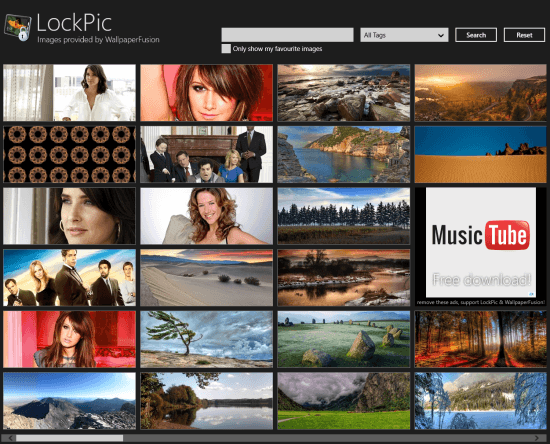 LockPic is a simple & lightweight Windows 8 app to change Lock screen on your machine. This lock screen changer Windows 8 app lets you change the default Windows lock-screen quickly with an image of your choice. In addition, the easy availability of thousands of interesting wallpapers from WallpaperFusion makes the task somewhat interesting. LockPic is available for free under ‘Photo’ section of Window Store. On launching the app you will be presented a window with following interface. On its top exists a textbox for searching images over WallpaperFusion. Adjacent to it is the dropdown list for filtering images on basis of different tags. By default LockPic will show you the newest images from WallpaperFusion. The primary task will be to search for an interesting wallpaper. On finding one, you will require clicking on its thumbnail after which you will be taken to a new window. 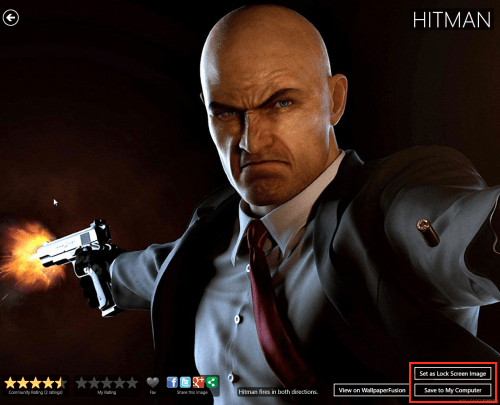 Then, you require to click on ‘Set as Lock Screen Image’ button on the bottom-right section of the window. Alternatively, you can click on ‘Save to My Computer’ button to use that image as wallpaper or some other purpose. There is no restriction regarding the number of changes you can perform. To view the current lock screen, you’ll require pressing ‘Win+L’ buttons simultaneously. For rating image or for adding it to favorites you must be logged-in. In case, you are new to WallpaperFusion, then create an account or login directly via Facebook. Also, check out our posts on Start Menu Button Software, Disable Lock Screen, and Wallpaper Apps. To Install LockPic Windows 8 app to change lock screen, you will require opening this link in supported browser such as Internet Explorer 10 or Later. Then click on ‘View in Windows Store’ button followed by a click on ‘Install’ button. (Both in top-left section of respective interfaces). This 467 KB App won’t take much time to install. * Requires access to your Internet connection. The overall impression delivered by LockPic App was quite good. The limitation of this Windows 8 App is that you does not delivers you the option to set local images on Lock-screen. Still, I have no issues in recommending it.